One of my go-to snacks in the afternoon is typically a nut & cheese combo. I especially LOVE the sweet nut with a tangy sharp cheddar cheese. Although I love some packaged nuts, like Blue Diamond All Natural, I like making my own sweet treats! This recipe is so easy, but it is a great snack to bring to work every once in a while. I try to limit my sugar intake during the day, but I do like to change up my snacks. Try this one and experiment with different types of nuts. Heat a skillet over medium high heat. Place the nuts in and coat with cinnamon. Stir quickly and then drizzle the maple syrup over the nuts. 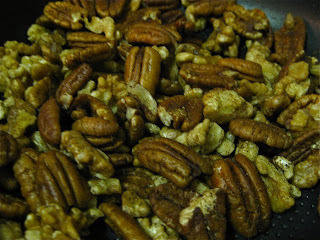 Cook for several minutes until nuts are toasted and syrup is carmelized. Grind sea salt over the nuts. Keep refrigerated in an airtight container for about 2 weeks. I paired about 1/4 cup of nuts with a Kraft 2% sharp cheddar stick. It kept me full all afternoon. Enjoy! Previous post: Australian Organic Yogurt!